Mummy-Tips: Baby & All Bag Carrier and changing bag in one! Baby & All Bag Carrier and changing bag in one! Now if there ever was a good idea then this has to be it. All of you out there with a toddler will be only too aware of their fierce determination to walk everywhere - until they actually have to do it that is. How many times have you been caught short without your pushchair and end up lugging your heavy little one till your arms are ready to burst? The Baby & All bag is the complete answer! 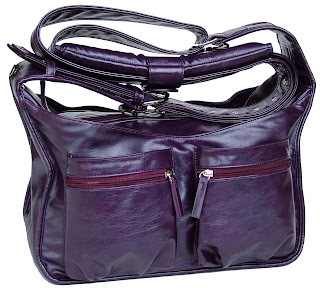 It is a handbag / changing bag that with a couple of adjustments becomes a carrier too. You don't have to empty your bag to get it into carrier mode which makes it perfect for those times when their little legs just won't walk any further. It comes in a few different styles but I especially love their new designer option that is just about to hit the shops. It is going to sell for around £90 but it looks like the kind of handbag that I am more than happy to be seen out and about with.